The annual planting debate is starting to heat up. Given that the crop insurance price discovery period for corn and soybeans is rapidly coming to a close, we examine where those guarantees stand and what they might mean for the coming 2018 growing season. The annual planting debate is starting to heat up. At the USDA’s annual Ag Outlook Forum, the USDA projected that U.S. producers would plant 90 million acres each of corn and soybeans. One of the factors that they cited as driving this prediction was the similarity of conditions between last year and this year. The initial crop insurance price guarantees for corn and soybeans is one of the factors that we watch to get a feel for where plantings might land. Given that the crop insurance price discovery period for corn and soybeans is rapidly coming to a close, we examine where those guarantees stand and what they might mean for the coming 2018 growing season. While the crop insurance price discovery period runs through the end of February, there are a few things that we can already observe about prices. First, both the corn and soybean price levels are remarkably close to last year’s price levels. To say that the price relationships are similar to last year may be a bit of an understatement. As of February 25, corn stood at $3.95 ($0.01 lower than 2017) and soybeans are at $10.13 ($0.06 lower than 2017). Recall, that last year this price relationship resulted in producers planting roughly equal acreages of corn and soybeans. Before we can quickly conclude that a repeat of last year is in store, it is worth examining whether costs have changed, or whether other factors have changed that might lead producers to alter their plans. In Table 1 we show the corn crop insurance price guarantees, estimated revenue at an 80% guarantee level, estimated variable costs, and the net guarantee for each year from 2007 to 2018. The table assumes a corn yield of 206 bushels per acre and variable costs estimated by Purdue for rotation corn on high quality Indiana farmland. Obviously, the assumed variable and fixed costs vary from farm to farm and state to state, but we think that this is a reasonable place to start. Today, with 80% crop insurance coverage and an APH of 206 bushels of corn per acre a farmer would be able to guarantee crop revenue of $651 per acre. As a note, this calculation does not take basis into account. In some situations, the actual revenue that would be generated could differ substantially from these values due to differences in basis. The final column of this table shows the net guarantee. This is the amount by which the revenue guarantee on an 80% revenue protection insurance policy exceeds the estimated variable costs of production. At $219 per acre the 2018 net guarantee is the lowest in the table. However, it is basically unchanged from the previous three years. The net guarantee suggests that corn expected profitability before fixed costs is very similar to not just last year, but the three previous years. However, farmers have seen some reductions in fixed costs, so the situation is in fact a little better than in previous years. For instance, in 2015, the estimated cash rent and other fixed costs were $295 and $212 per acre, respectively. This means that the net guarantee goes much further toward covering these costs than it did a few years ago. The soybean crop insurance guarantees are shown in Table 2. In the case of soybeans we assume an 80% coverage level on a 63 bushel per acre yield and variable costs of $259 per acre. The cash rent and fixed costs are the same as in the corn example above. The net guarantee for 2018 is $252 per acre. While this is among the lower net guarantee levels, unlike corn it is not the lowest in the table. Because Purdue has increased its estimate of the variable costs for soybeans, the guarantee is $21 per acre less than that in 2017. So while the 2018 crop insurance price is nearly the same, the variable cost increases have effectively lowered the net guarantee. Still, the net guarantee for soybeans would be sufficient to cover the estimated cash rental costs of $246 per acre. Although the net guarantee for soybeans declined slightly from 2017, it still exceeds that of corn. Figure 1 shows the net guarantee advantage of soybeans over corn from 2007 to 2018. Recently much has been made of the acreage shift from corn to soybeans. Given the results shown in this figure such a shift is not surprising. From 2007 to 2013, the net guarantees clearly favored corn, whose net guarantee exceeded soybean by values ranging from $22 (2008) to $118 (2007) per acre. Since 2014, soybeans have seen an economic advantage of anywhere from $53 (2017) to $13 (2016) per acre. This year that advantage is $33 per acre. While this is down from $53 in 2017, it is still likely large enough to command significant acreage. Whether it is large enough to move even more acres away from corn remains to be seen. Figure 1. 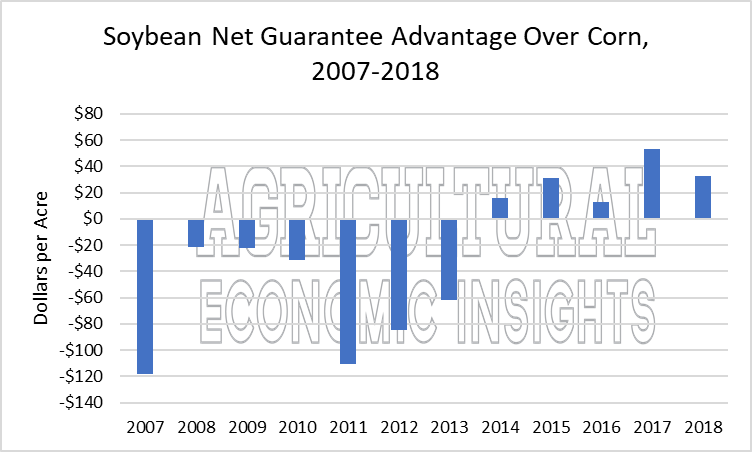 Soybean Net Guarantee Advantage over Corn, 2007 to 2018. As the crop insurance price discovery ends, it allows us to take an initial look at some of the economic considerations that will drive planting decisions. The current guarantee prices are nearly identical to last year. The net guarantees (after subtracting variable costs) for both corn and soybeans remain at relatively low levels, but are more attractive than the last few years due to declines in the estimated fixed costs of production. In other words, although the guarantees don’t look rosy, given the declines in fixed costs, the same dollars go further toward covering total costs than just a few years ago. At present, soybeans hold a $33 per acre net guarantee advantage over corn in the region we examined. This advantage has shrunk from last year when it was $53 per acre. The reason for the decline is due to increases in the estimated variable costs of producing soybeans and flat variable costs on corn. While the overall advantage may have declined a bit, it appears that soybeans will again be very competitive with corn for acreage. However, it would appear that the economic incentive to plant beans slightly less or at least no stronger than it was a year ago.